How to Return the Goods from Warehouse to Taobao Seller? I have received many emails from my readers, saying that their purchased items have been rejected by the warehouse, and that they wanted to return the items to the sellers. This article aims to guide you how to return the goods from the warehouse to the sellers. It is recommended that you go to “Purchased Items(已买到的宝贝)” to find the relevant order, and apply “Refund/Return(退款/退货)” / “After-sales application(申请售后).” Click here to see more details. After the seller has agreed on your application for return or refund,they will provide a return address on the refund application,this address will be used for the following steps. I do recommend you to aliwangwang with the seller before you submmit the application to smooth the process. 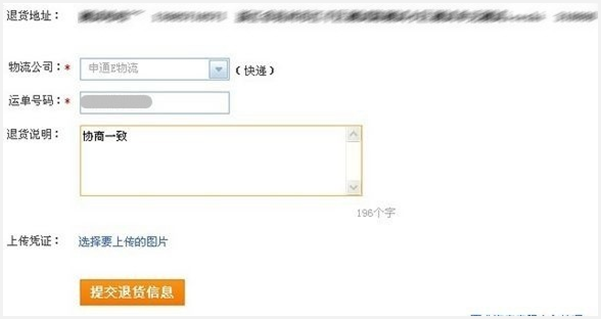 Go to “My Taobao” – “Purchased Items” – click “Taobao Consolidated Shipping(官方集运)” on the left, find your order, and click the “Return to Seller(退回卖家)” button to return the goods. 1. 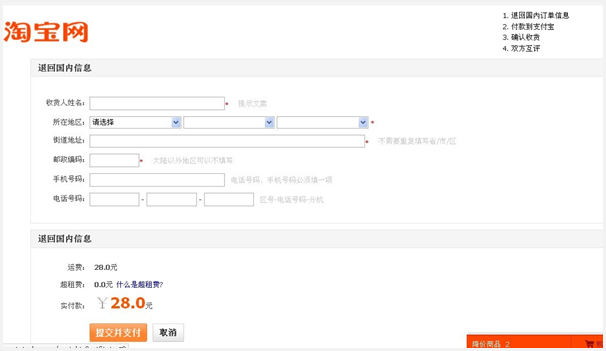 On the consolidation order page, click “Orders to be consolidated(待集运订单)” to find your forwarder. Find the order that you wish to return, click “Return to Seller(退回卖家)”. 2. Find the seller’s address from the refund application, fill out the form, and pay for the shipping fee will do. 3. After your forwarder has sent out the goods, you may check the waybill number from your order details (you can also enquire for the waybill number from Alipay’s online customer service). After filling out the form, click “Submit information” and that’s all. You will receive your refund after the seller has received the goods! Hi, I have contacted zhongshan many many times about a package that they weighed at 8.560kg when the true weight is only 260g and is very very small in volume. They said they notified the team for weight verification but its been 3 weeks now and this is what they keep replying to me on the chat which I don’t understand the meaning of. They said they notified the warehouse but still nothing what do I have to do??? I’ve recently had to do my first return/refund from the forwarder’s warehouse and am pretty sure with my limited Chinese have done everything right so far. I managed to get a refund application going, gotten the seller’s return address, and inputted everything into the 退回卖家 screen for the forwarder. I just wanted to know where I can find out if the forwarder has actually sent the item back yet or not. It’s been a couple of days already, but I’m not sure where to look for confirmation so I can fill in the tracking details for the refund application. you can contact your fowarder,they will give you the tracking number for return. I want to contact Zhongshan about my package, but I don’t know if they know English? How do I contact them? The warehouse says that my package is an error, so I issued a return/refund with the seller and they approved. Now, when I want the warehouse to return the item back to the seller, the item doesn’t let me choose it and it stills says error and that I need to contact them. I really need help with this. Hi Eric, I bought pens that have to be sent back to the sellers and the only reason I know that these wouldn’t have been sent to me is perhaps they include ink which is on the list of things that can’t be sent over. But two of them shouldn’t have ink at all because they’re ‘eyedropper’ pens. Would I have better luck going through a purchasing agent to get around this nonsense? yes,you have to go through an agent to buy this item. I have two items that have been rejected by warehouse. One item is banned goods the other says the size is too big to import. What do i need to do? How do i contact the seller directly? download aliwangwang to livechat with the seller to get your money back. you must input every field correctly. i’ve started the return process and the seller okayed the return. Paid the return fees. I’m stuck in the waybill number part (#3), where do i get that waybill number from? I’ve contacted the forwarder already and they indicated the return process started and is waiting for me to complete #3. Do i need to wait for the forwarder to do the return first in order for the waybill number to appear? yes,you need to wait for the forwarder to do the return first to get the waybill number. I’ve managed a successful return to the seller via Taobao, and the seller has approved a refund. But now I’ve a “因您支付宝账号身份验证问题，退款资金如果退回余额后将无法直接使用” message about Alipay. My original payment was done via Credit card, but the refund link seems to want a Chinese bank account. ignore that message,money will be back to your bank card. Indeed it was. Thanks a lot Eric. You’re a lifesaver!!! Hi Eric, I have bought some items from Taobao. The items have arrived to the warehouse but I left there for over 20 days. Now I could not find the consolidated shipment buttons for the items. Please help. you need to contact your forwarder. I successfully started a refund and got a return address from the seller. Now I am trying to fill out the return shipping address form, but it keeps saying “Submit Order Failed”. What am I doing wrong? I need to see the screenshot to give you the answer,but please check each field,make sure you input it correctly. Ah, nevermind. I forgot to add the phone number. I do have a question. The warehouse shipped it back to the seller using 中山速递 but I cannot find the logistics company in the drop down menu to confirm the return. Which one would it be? you need to ask zhongshan courier customer service. So I ordered 5 items from same seller and seems like some items in the order can not be shipped. It says special item and storage issue. Since I don’t speak Chinese, I am a little bit frustrated. Do I have to return everything I ordered from this seller or can I keep the items that the warehouse can ship and return the problematic items? And how do I find out which item is not shippable? you can only return problematic ones,and you can contact your forwarder,they will tell you which one you should return. hi Eric, what to do if they give the wrong waybill number at the taobao order. I requested for a refund, but then the seller gave me a right waybill number. now my item is stucked at the warehouse because taobao system cannot detect my order. so I cannot pay transit fee. so how? contact your forwarder,show them both the wrong and the right waybill number,they will manually match it with your parcel. Hi Eric, i bought few item and 1 of the item warehouse wrongly calculate the shipping fees when i made the order payment. item arrive at warehouse and contact me that the item was oversize and they gave me option either ship by sea plus add some fees or return to seller. I agreed to return to seller and seller also agreed accepted my return. At the page when we paid for the return only show yuan12, but now seller asking me to pay him yuan120 for shipping fees. So how i need to go about?? what is the size of your item? unless they are charging dimenentional weight,120 yuan is a big amount for domestic shipping. item size was 92*36*32cm. The problem is i just submit the return and warehouse still not sending back to seller. And seller asking 120yuan. But at return deliver fees only show 12yuan. This is because Taobao Global Direct Shipping fault wrongly calculate deliver fees when i purchase. 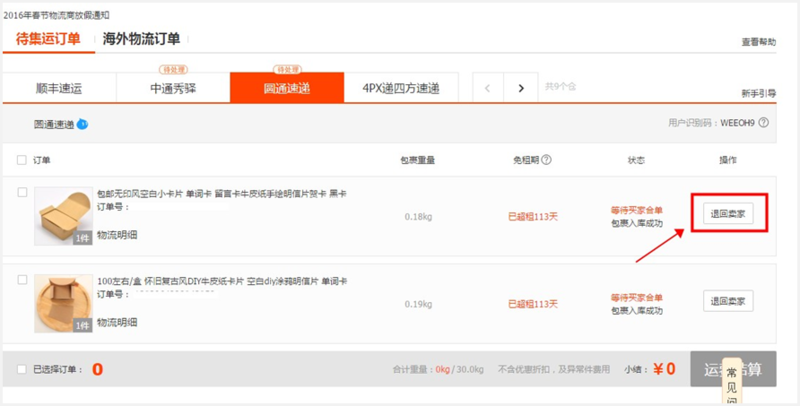 you’d better chat with taobao customer service now,they will help you negotiate with the forwarder. Hello Eric, my seller agreed to return and refund on the products that i bought. The list of courier service that she provided is not available in Malaysia. How do i ship the item back to them for the refund ? you need to find a courier locally that can ship items to China. I purchased 5 items to be grouped and shipped overseas. However, 1 of 5 items was rejected by the warehouse for shipping due to transport policies. Return shipping for the item is more costly than the item itself. I would like the warehouse to trash the item instead of returning it. Is this possible? In addition, will this process disrupt the original shipping process. I don’t want the other 4 items to be delayed. Hi,yes,it is possible,some readers did this before.you just need to contact your warehouse,tell them which item you want to trash.and No,it won’t disrupt the original shipping process for other 4 items. If we paid via eNets, would the refund be automatically credited back into our bank accounts? Or would it be credited to Alipay. it depends on the refund type.Refund be automatically credited back into your Alipay accounts if it is a successful transcation.will be back to your bank accounts if it is a failed transcation.